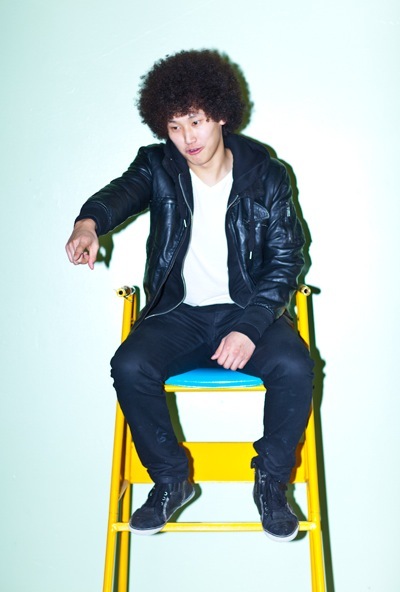 Walter Mak doesn’t deny that his hair, styled in an Afro, attracts attention. Nor does he claim credit for originating the idea. “I favor dark clothes — nothing too bright or light. Nothing so outstanding that it sticks out. “I used to collect shoes a lot. But now I look for stuff that’s minimal. Not too flashy. Most of my shoes are black now. Half high tops and half sneakers. “I’m really picky about jeans. Sometimes it’s hard to find the right fit. I don’t like to wash jeans because they fade. So, if I have jeans that need washing, I get a new pair. I like the feel of new, raw demon — it’s rough and fresh. “For shirts, lately it’s just been a white t-shirt or v-neck. I used to buy stuff from street wear companies, but I feel like I’m getting too old for that. Back to his hair, Walter says it’s not hard to care for. He gets it permed only every six months and does trims himself. Editor’s note: Do you know someone who has a distinctive style? Send your suggestions to tips[at]inmenlo.com.